Rogers; Harney (Keegan 90), E McMillan, Shorthall, Bermingham; Murphy, Mulcahy, Bradley, Doyle; Kavanagh, North. Doherty; Molloy, Greacen, S McEleney, Lafferty; McGlynn, McLoughlin, Deery, Higgins; Zayed, P McEleney (Harkin 62). 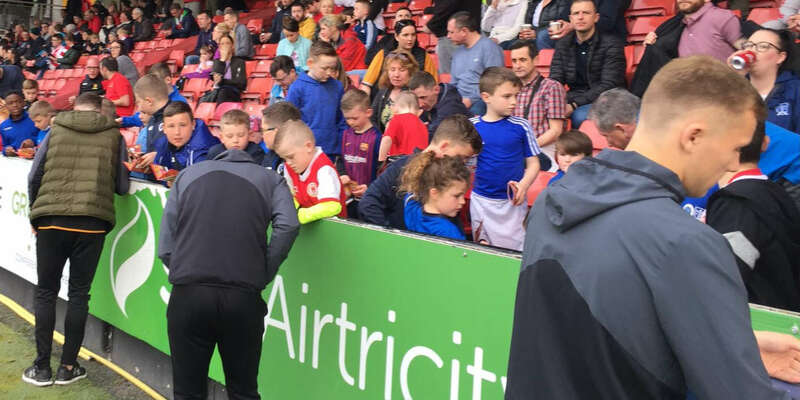 St Patrick's Athletic and Derry City took a point each from a highly entertaining match before a crowd of 1,236 at a wet Richmond Park in Inchicore. Derry took the lead on the half hour when Stephen McLoughlin knocked the ball past Gary Rogers and into the net off the upright. Danny North put Pat's back on level terms on the stroke of half time with a neat shot past Ger Doherty. 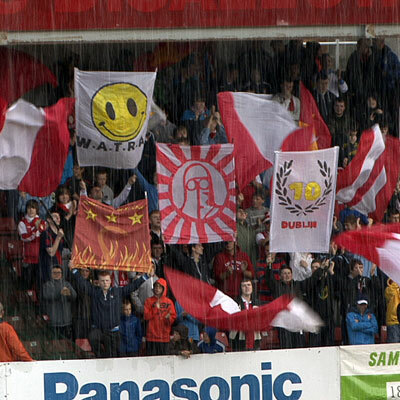 A torrential hail storm started falling over Dublin 8 just before kick-off and continued to lash down as the game started. Pat's were quick out of the blocks and with just seconds on the clock Daryl Kavanagh met Derek Doyle's ball from the right but slammed his shot over Doherty's crossbar. Soon after that Stephen Bradley's shot was cleared by Stephen McLoughlin after the Pat's captain after a short corner on the right. Derry had their first attack on five minutes with Pat's keeper Rogers diving well to save McLoughlin's shot into the Shed end goal. McLoughlin then headed wide from Ruaidhri Higgins' free a minute later. Pat's enjoyed a slight upper hand as the enticing encounter continued with Dave Mulcahy Bradley, both having pops on goal but neither could hit the target. The stinging hail had by then been replaced by a light shower but the heavy precipitation had left a soggy surface for the sides to contend with. Derry worked a lot of balls up to Eamon Zayed as the half progressed and a decent move on 25 minutes saw the ball delivered to the former Sporting Fingal man by Gareth McGlynn but Zayed angled his header wide. Doherty then pulled off arguably the save of the season on 29 minutes with a fantastic block with both hands from Danny North. Derry always looked dangerous on the counter attack and punished Pat's when they took the lead on the half hour. McLoughlin got onto a Higgins pass, and knocked the ball past Rogers and into the net off the upright. Pat's fought back and one of their best moves before the break saw Kavanagh involved before Bradley found Ian Bermingham deep on the right. Bermingham's half shot/half cross sailed into the box and Doherty deemed it dangerous enough to rush and out and claim ahead of his defence. 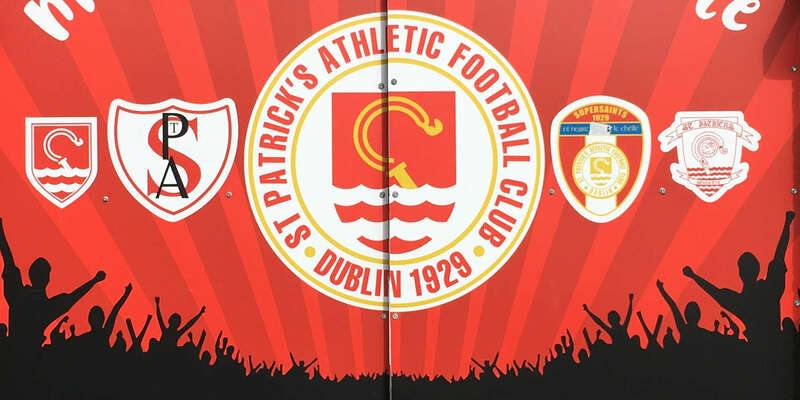 The Pat's perseverance persisted and they were back on level terms just before the break when Neil Harney's cross was met by North and the English man made no mistake, beating the offside trap and sending his creative shot past Doherty. Pat's fans were shouting for a penalty soon after the restart when Shane McEleney took down North in the area but referee Alan Kelly waived play on. 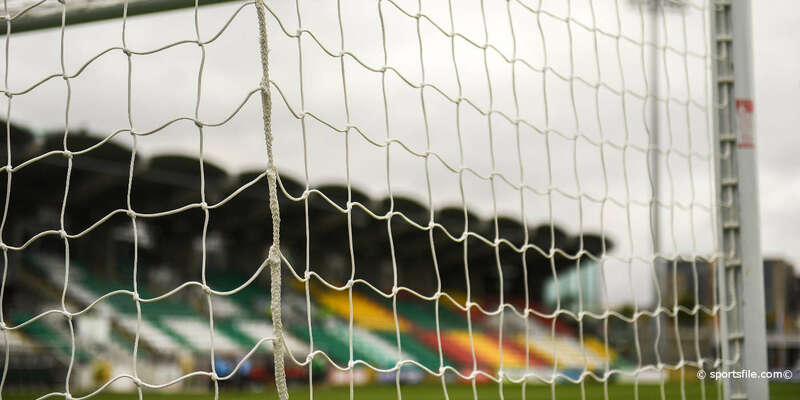 Doherty was standing in the right position on his line on 54 minutes when Derek Doyle connected with a cross from Kavanagh and smashed a fierce shot on target but unluckily for Doyle the ball cannoned away off Doherty's chest. Pat's continued the pressure and North shot inches wide from Mulcahy's pass on 56 minutes while Doherty saved from Anto Murphy just before the hour mark. Indeed the Derry number one had a tremendous night for the visitors making vital saves with his hands, feet and chest. Danny Lafferty put in a good shift for Derry and was instrumental in blocking a creative Pat's move in its tracks on 61. North picked out Mulcahy with a neat low pass but Lafferty stuck his foot in at the vital moment and cleared the danger. Doherty got the better of Mulcahy on 71 as the home side enjoyed another dominant spell. Derry had their chances too with the right hand post coming to the rescue on 74 to stop Lafferty's free kick. On 85, Rogers saved Zayed's effort after McLoughlin's long cross, with the Pat's defence tidying up before Ruairi Harkin could capitalise.